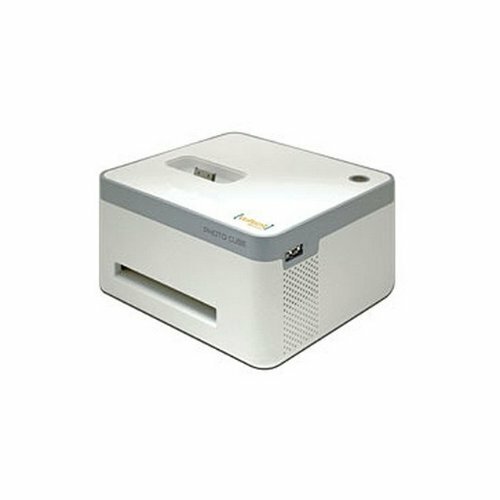 The Photo Cube Compact Photo Printer from VuPoint Solutions is a dye-sublimation printer that charges and prints photos from your iPhone, iPad, iPod Touch, or Android device at the same time, no computer required. The printer's combination paper and ribbon cartridge yields 36 prints and makes it easy to use. The printer outputs standard 4 x 6" photos that are waterproof as well as coated to minimize fingerprints, dust, scratches and photo damage. In addition to 4 x 6" photos, the printer can partition a 4 x 6 photo sheet into 4 or 10 images per sheet, perfect for passport or ID photos.